Central Bank governor Philip Lane appeared before the finance committee this week. THOUSANDS OF IRISH people are still battling with their banks to be included in the tracker mortgage examination and some may be forced to go to the courts to get their money back. The tracker mortgage controversy saw tens of thousands of customers being overcharged by their lenders when they were either denied a tracker rate they were entitled to, or charged the wrong rate of interest on their mortgage. 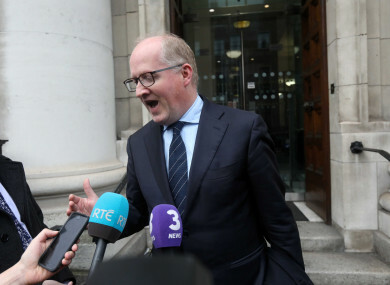 This week Central Bank governor Philip Lane and some of his officials appeared before the Oireachtas Finance Committee to give an update on a number of areas, including the tracker mortgage examination. As of end-March 2018, approximately 37,100 customers have been accepted by lenders as having been affected by tracker mortgage failings. This was an increase of 3,400 customers since December. Speaking to TheJournal.ie, financial adviser Padraic Kissane, who attempted to highlight this overcharging a number of years ago but was ignored, said he believes there is still an additional 3,000 impacted customers who should be included in this examination. This would bring the figure to above 40,000 accounts in total. “Unfortunately the waiting room is still a busy waiting room and it’s still six weeks to the end of June [when all identified customers are expected to have compensation offers]. For people it’s the ‘don’t know factor’ that is the worst,” he said. One man who believes he is affected by the overcharging scandal has put his house, which he bought with his brother in 2006, up for sale because they can no longer afford to keep paying the mortgage. Cian told TheJournal.ie that they were put on a 10-year fixed rate in 2006 and the bank has argued that by agreeing to this rate, they effectively rejected the option of a tracker. Before that deal expired in July 2016, Cian had heard of banks being unfair to those who had taken mortgages, and rechecked his documentation. He contacted the bank and wanted to confirm that he was entitled to a tracker mortgage. “The contract at best wasn’t clear, but I believe it was referring to a tracker rate,” he said. I wrote to the bank to ask for a tracker because I wanted to stop the banks in their tracks, no pun intended. I was being very clear what we wanted before the fixed term ended. In May/June 2016 he was told that his case would be going into a tracker examination, and that the tracker examination wouldn’t be finished until March 2017. Meanwhile, his mortgage contract ended in July 2016. Cian also made a complaint to the Financial Services and Pensions Ombudsman (FSPO). His bank told the ombudsman that he fell within the scope of the examination, but was not impacted. He is still in correspondence with the ombudsman’s office now, having argued against the bank’s claim his account was not impacted by overcharging. The FSPO told TheJournal.ie that the best way of ensuring its office has all the necessary information to deal with complaints relating to tracker mortgages is to away the outcome of the Central Bank examination. “Furthermore, if there are people who believe that their bank has not provided the redress and compensation that they believe they are entitled to, then they can make a complaint to this office,” it said. The FSPO is conscious that many of the mortgage holders who have complaints with this office have been waiting a considerable length of time for the examination to conclude and additionally may have been engaging with their financial service providers for a number of years on the issue prior to the examination being commenced. For this reason, the FSPO will endeavour to prioritise tracker related complaints when the examination process has concluded in respect of those complainants. Another customer who believes she has been impacted is still waiting for her bank to tell her whether she will be redressed and compensated. Anne moved from a tracker to a fixed rate in 2007 when she went back to university to do a master’s degree. She said she specifically requested at the time to be allowed return to a tracker rate at the end of the fixed period. She came off the fixed rate in 2009 but the bank denied it had agreed to these terms two years beforehand. Like Cian, she also complained to the ombudsman, but this was back in 2010, before the current examination was launched. Her complaint was rejected at the time. Now her bank is reviewing her account to assess whether she should be included in the examination. Anne believes the overcharging in her case could be as much as €40,000. This is costing me about €400 extra per month for the last nine years, I have two small children and am really struggling despite being fortunate enough to have a secure and well-paid job. “I have had to be careful over the years. No big holidays, we had to be very sensible when we got married. I am a good saver, I have always been careful with money. I feel like I was ripped off,” she said. The Finance Committee has expressed concern previously about cohorts of customers in certain financial institutions. A number of AIB customers had contracts which included an entitlement after a fixed period to the ‘prevailing rate’. The bank has since calculated that the tracker rate they would have been entitled to was 7.9% and they therefore suffered no financial detriment. The bank has agreed to pay these customers 1,000 in compensation and €615 for professional advice, but committee members have called on the regulator to challenge this more robustly. The committee has also heard that EBS and First Active (now Ulster Bank) customers are coming up against resistance or are facing delays in the examination. Central Bank governor Philip Lane told members this week that 88% of the identified affected customer accounts had received offers of redress and compensation. He said further offers are expected to be made to the remaining 12% by the end of June. To end-March, €459 million has been paid out to consumers, an increase of €162 million since December. “In short, the cost to lenders is fast approaching the €1 billion mark,” he said. Lane said payments “may extend beyond that date for those customers who are newly identified and verified in the coming weeks”. Financial advisor Padriac Kissane said it raises concerns that the Central Bank has said it disagrees with the position of certain lenders, but can not force them through regulation to change the way they deal with this cohort of customers. He said he is pleased with the numbers that have already been identified, though he said this should have happened years ago. He said he is worried now about the cases that are still in dispute. “If someone is the one case that’s deemed not impacted, that’s still just as traumatic. We have people who got trackers who never even knew they were entitled and then people who have been arguing about it for a long time but who will be disappointed,” he said. Kissane said some customers will be able to go to the Financial Services and Pensions Ombudsman once the examination is over, but others will have to go to the courts in order to get their money back. He said the fact that some of the banks are still pushing back on interpretations of individual words in contracts with customers who he believes have been overcharged shows that they are not serious about committing to a real culture change in their institutions. He said it “will be interesting” now to see how this supposed culture change will play out when their legal teams face off with customers in the courts. - With reporting by Gráinne Ní Aodha. Email “'I am really struggling': Thousands still left in tracker mortgage scandal limbo ”. Feedback on “'I am really struggling': Thousands still left in tracker mortgage scandal limbo ”.